Valentino Rossi and Jorge Lorenzo head to the Pramac Australian Motorcycle Grand Prix separated by just 18 points with 3 races to go. The 2015 MotoGP™ World Championship saw another dramatic twist at the Japanese GP as Repsol Honda’s Dani Pedrosa, who clearly had not read the script, won his 50th GP with Rossi and Lorenzo completing the podium. This meant that Rossi extended his advantage by four points to 18 over his teammate Lorenzo in what is turning into one of the most tense championship battles of all time. The title fight has now also officially become a two horse race as the third placed Marc Marquez is now out of contention due to the fact he is 85 points behind Rossi, with just 75 points available. Up next is the Australian GP at the legendary Phillip Island circuit, where once again Rossi and Lorenzo will face-off against each other in a bid to strike a decisive blow in the championship battle. The Australian GP was introduced to the World Championship calendar in 1989, and apart from six GP’s during 1991-1996 at Eastern Creek, it’s home has been the historic Victorian track that has hosted racing since 1928. Last year’s Australian GP saw Rossi take the race win by over ten seconds from Lorenzo, after Repsol Honda’s Marquez had crashed out of a commanding lead. If history were to repeat itself in 2015, Rossi’s advantage would be up to 23 points heading to Sepang. Rossi is the most successful rider in the modern era at Phillip Island, having taken 8 victories across all classes (2x 250cc, 1x500cc, 5xMotoGP™). This includes a run of 5 premier class victories in a row between 2001-2005, and the ‘Doctor’ was also ever present on the podium at the circuit across all classes between 1998-2010. 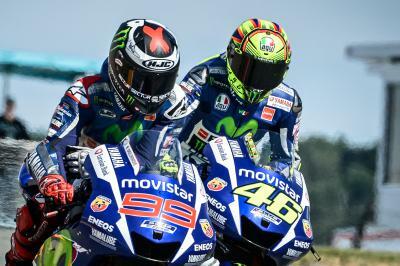 Last year saw Rossi taste victory in Australia for the first time since 2005. The nine-time World Champion will be hoping to repeat this feat in 2015, although he knows that if he finishes second to Lorenzo in the last three races it will still be enough to see him lift that elusive tenth title. 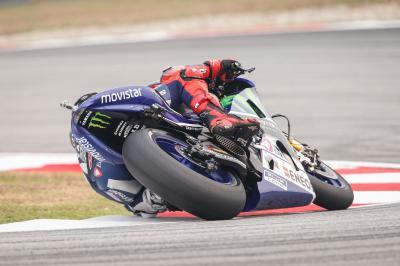 Lorenzo has only won once at the circuit in the premier class, back in 2013; although he did also take the 250cc race win in 2007. More tellingly he has not finished lower than second in the last three years at Phillip Island, but he knows he needs to win the remaining three races of the season to pile as much pressure as possible on Rossi if he is to be successful in his bid for a third MotoGP™ crown. 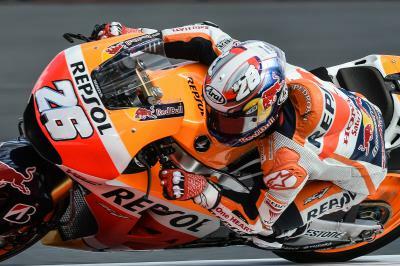 Pedrosa, whose return to form could see him play a major part in deciding where the title ends up in 2015, has never won in the premier class at Phillip Island before, with his best result being second in 2013. He did take the 250cc race win in 2005 and one thing is for sure, if he can maintain the pace he has shown at the Aragon and Motegi, he will be threat to the podium once more. Last year he was forced to retire after contact with Andrea Iannone damaged his bike. 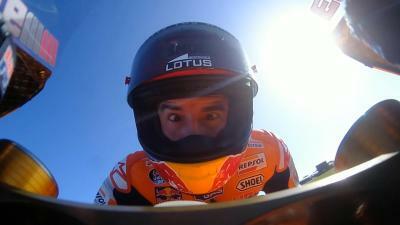 His teammate Marquez finished in fourth at Motegi despite riding with a broken left hand. 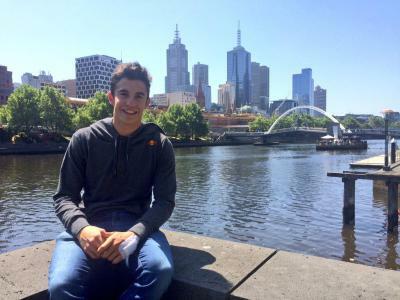 An extra weeks recovery should aid the Spaniard although Phillip Island is one of the only two tracks on the calendar, along with Motegi, that he has not won at in the premier class. In fact he has never even registered a result at the track in MotoGP™, after crashing out of last year’s race and being disqualified in 2013. 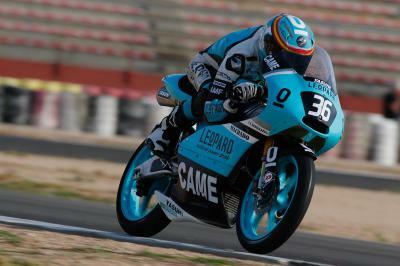 He did however win the 125cc race in 2010 and, after starting from pole, was leading last year’s race by 4s when he fell. Ducati Team’s Andrea Dovizioso now finds himself seventh in the championship standings after finishing fifth at Motegi, but only 4 points behind the resurgent Pedrosa in fifth. Last year he crossed the line in fourth for his best MotoGP™ result at the track, although he has won in Australia before in the 2004 125cc race. His teammate Andrea Iannone crashed out of last year’s race and has a best placed MotoGP™ finish of 8th in 2013, but stood on the podium in the 2010 Moto2™ race. Team Suzuki Ecstar’s Aleix Espargaro has only managed two MotoGP™ top ten finishes in Australia, with his best result his eighth back in 2012 on the Pramac Ducati. 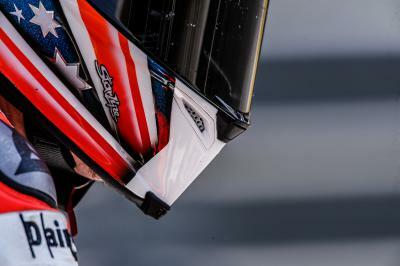 In last year’s race Stefan Bradl took out the Spaniard while they were battling for fifth. His teammate Maverick Viñales won the Moto2™ race at the circuit last year and was on the podium in Moto3™ in 2013, as the Spaniard looks to bounce back after crashing out of the race in Motegi. Bradley Smith (152pts) on the Monster Yamaha Tech 3 M1 still leads the Satellite battle by 54 points despite losing out to LCR Honda’s Cal Crutchlow (98pts) in the battle for sixth on the last lap at Motegi. The fight for second is heating up though, as with Octo Pramac Racing’s Danilo Petrucci’s (93pts) crashing out at the Japanese GP, the Italian now finds himself trailing Crutchlow by five points with Smith’s teammate Pol Espargaro also (88pts) hot on his heels. 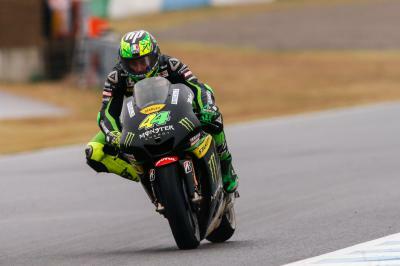 In last year’s race Crutchlow crashed out from second on the last lap to gift Smith the final podium spot, while Espargaro also crashed out and Petrucci crossed the line in 12th on the IodaRacing ART. EG 0,0 Marc VDS’s Scott Redding recorded his best result of the season at the Australian GP last year, crossing the line in 7th on the Gresini Honda. Avintia Racing’s Hector Barbera (30pts) took the Open class victory at the Japanese GP as he finished in an impressive ninth place. 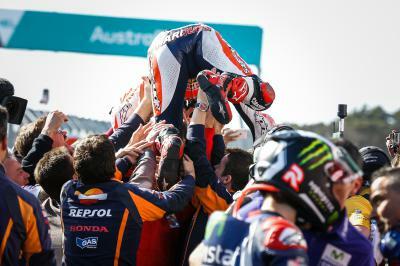 Barbera’s career best MotoGP™ result came at the Australian GP last year when he crossed the line in fifth. His main rival in the class, Forward Racing’s Loris Baz (28pts), was forced to retire from the race at Motegi with front-end issues and now trails the Spaniard by two points. The battle to be the leading Open Honda rider currently sees both Jack Miller (LCR Honda) and Nicky Hayden (Aspar MotoGP Team) tied on 16 points. The Pramac Australian Grand Prix officially kicks off with Thursday’s Press Conference at 17:00 local time, with the on-track action starting at 10am on Friday with Free Practice for all three classes. Click here for the full schedule and latest championship standings. Marquez claims his 50th GP victory in “The race of the decade” that saw 52 overtakes between the Spaniard, Rossi, Lorenzo, and Iannone. Eyes were transfixed on Marquez and Rossi after their run in during Thursday’s press conference, but it was two others who dominated Friday. 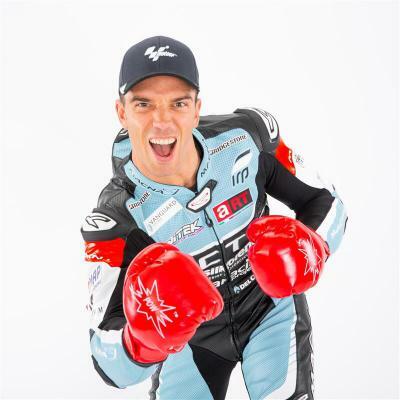 Following the recent announcement of Hiroki Ono’s injury, the Leopard Racing Team announce Joan Mir to compete the race at Philip Island. Again Jack Miller showed his potential in the wet but as in Silverstone, the Motul Grand Prix of Japan ended in disaster. Bridgestone Motorsport’s Shinji Aoki discusses why tyre performance played such a key part in deciding the race at the Japanese GP. Dani Pedrosa is now joint third in the all-time GP podium finishers with 139 after the Japanese GP, only Rossi and Agostini have more. Maverick Viñales continues to learn in his rookie season, battling changing conditions at the Motul Grand Prix of Japan. Pol Espargaro falls from the Motul Grand Prix of Japan with just three laps to go, ending a tough weekend with disappointment. 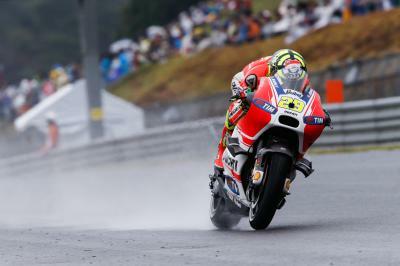 The Motul Grand Prix of Japan sees Andrea Iannone unable to score points for the first time in 2015.